Rob WHITE: I think the first thing to say is that we are pleased now to have a fairly clear view of where we are going and the most important thing about the 2014 rules is that there are enough people who now understand them and know what we are getting into so that we can go ahead and do the work to deliver these engines in a sort of timely fashion and get all the cars on the grid prepared to go racing for the first race The fact that we made a bit of an adjustment from four cylinders in-line to six cylinders is, on one hand, a pretty major change. On the other hand it‘‚ s a relatively modest change. The fundamentals of the rules stay as we had in mind with a double limitation on fuel consumption with a fixed amount of fuel for the race, a fuel flow limit, a big contribution from energy recovery systems, electric only traction in the pit lane. We have got many of the same fundamental building blocks, albeit with a different engine architecture and a programme timing that I think suits more people better than the original programme timing. White: The first thing to say perhaps is that we were well underway with the previous programme, so substantial amounts of work from that go straight in the bin. Not all of it, thankfully. We try to recover what we can and re-orientate it to the new programme. As ever we may need to structure the engineering programme counting backwards from the first race in order to arrive in the most competitive possible state. Important to recognise that this is a massive technological change for the engine people in F1. Clean sheet of paper, new engine, fundamentally very different to its predecessor, hasn‘‚ t happened really since we made a switch in the opposite sense from turbo to normally aspirated engines way back at the end of the 1980s. Q: So the strategy from Renault‘‚ s point of view: can you give some indication of that? Presumably you almost welcome this engine change as well, as you were a little frustrated with the V8? White: I think one of the conditions necessary for Renault to remain present in F1 was that F1 should move on and the family of, I prefer to say power unit, rather than engine, towards which we are now headed is something that creates a much clearer resonance with the products and the processes that we use for the cars that we sell to our customers in, I think it is, 118 markets worldwide. Graeme LOWDON: Yes, it has already started. We‘‚ ve known McLaren for a long time. We‘‚ ve worked with them in the past in Formula Three actually, with the Young Driver Programme, going right the way back to Lewis (Hamilton), so we know the people at McLaren really well and it‘‚ s not been difficult at all to engage the project. It is quite a big project and it is one that obviously we are hoping will move the team forward in a short space of time so that project has already begun and it is going very well. Lowdon: Yes, Banbury is a site that we have been using for some time with our previous technical partner and so we are now building that facility up and obviously using some experience from both within the team and our partners to do that. We will still run the race team from Dinnington for the rest of this season. It is exciting times for the team. A lot of steps moving forward and these aren‘‚ t things you just cannot make up overnight. They have been well thought through and well planned and there is a real air of excitement within the team. We have always had a very strong team spirit as I think most people know, but I think now we have got really a good technical direction and there was a vote of confidence from Timo Glock. He has committed to the team now for a long term and he has seen from inside the steps we are making so that was an important announcement for us as well that Timo is staying with us. Lowdon: Yes, it is early stages. Obviously, like most people we found out about it this morning. I think it is going to be interesting to see how it unravels. There are different sides to this. I have read that Sky has said it is good news for fans and they have said there will be an unparalleled experience for them and that sounds very exciting. To be perfectly honest I think it is up to the fans whether they think it is good news or not and that is something that remains to be seen. Obviously, we hope that it is. I think that will unravel over time. For a team like us, we actually get very little of our revenue from TV rights and it is very, very important for our entire commercial strategy that we maximise the global fan base and the number of people who watch our team in action, so obviously there are concerns there but equally we are entering a new era potentially for a commercial model for Formula One as well. Q: Adrian, interesting performance in the last few races and here as well. Was Nurburgring a blip for you? Maybe a downward blip slightly, but you have been so dominant so far this year. Adrian NEWEY: Difficult to tell. Obviously the competition is extremely tough. As we all know, what marks Formula One out over the last 10 years or so is just the pace of development through the year, so exactly where everyone is is difficult to know. There are bound to be variations from circuit to circuit. Newey: We try to keep the development programme flexible, but equally what drives our development programme is exactly that. It is not reacting to what‘‚ s going on around us. I think as soon as you start doing that you get yourself in a muddle. Q: And what about today? We saw this morning both drivers having slight incidents on the circuit. Mark hitting the barrier. How‘‚ s the car been performing today? Q: No it‘‚ s not! We saw Sebastian Vettel make two mistakes. He never makes two mistakes! Newey: I think if memory serves me well then in Turkey he made a fairly spectacular mistake early on, so it happens. He had, I cannot remember, he had one spin. I cannot remember what the other mistake was but if you say there was another one. Newey: Ok, but that‘‚ s hardly a mistake is it. Newey: Who knows. It‘‚ s a normal Friday, we don‘‚ t know what fuel load people were on et cetera, et cetera, so we are just trying to get on with our programme. Q: Jonathan, was it a blip upwards for you do you feel at the Nurburgring or can you maintain that? It certainly looks as though you were good enough today. Jonathan NEALE: I would echo what Adrian says about Fridays. When you are at the top of the pile it feels very good and you convince yourself that it is a good omen for the weekend and when you are not you remind yourself that Fridays don‘‚ t really matter. Certainly we were pleased with the race at the Nurburgring. The two previous races were quite painful for us. It was nice to return to form there and we have been successful at the German Grand Prix on multiple occasions so that was good. Fantastic drive for Lewis on that particular occasion and, I think, well deserved, and a good tonic for him and the team. We look forward to this weekend. I think we have got our work cut out. These guys are pushing very hard and so are Ferrari so we don‘‚ t expect anybody to take this one easily, but we will see what happens tomorrow morning. Q: How‘‚ s it working with Virgin? That side of things. Neale: Well, for us you have to remember the deal is with McLaren Applied Technologies, not with McLaren Racing that I am Managing Director for, so I am not deeply involved with it. But we are very excited about having the guys come and work with us. It‘‚ s small steps at the moment. We have got some trackside software running with them this weekend but later on in the year we will see them starting to use the McLaren wind tunnel, so exciting times but as I say early days. Neale: Well, I think the views and needs of the fans are of prime importance to Formula One. It has been very pleasing during the course of this year that the exciting racing that we have had has been matched by a growth in the audiences throughout the UK and across the globe. Some of that certainly is that the BBC has done a fantastic job in promoting that. I think we would welcome interest from other forms of media. The devil, of course, is in the detail. Mindful that there is a lot of heat in the air about that at the moment but we just don‘‚ t know the detail so it would be improper to comment beyond that. But what the fans need and want and a mass audience is something we need to pay attention to. Neale: No, not at all. 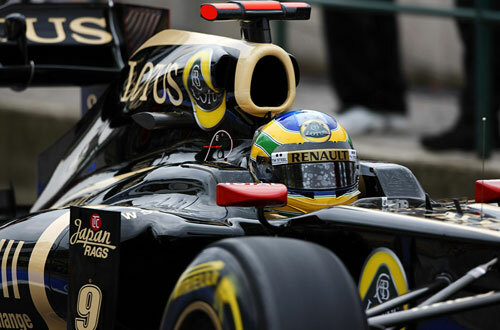 Eric BOULLIER: I think Rob described very well the Renault position. As a team we are happy that now we found a consensus which pleases everybody. Boullier: I just made a comment. There is clearly in the published rule on the FIA website, there was a statement saying the car should not be moved by an electric mode in the pit-lane and, obviously, I just made a comment that I could raise a safety concern about the lack of noise in the pit-lane which could be dangerous. Boullier: No, I didn‘‚ t.
Boullier: Yes, but I didn‘‚ t say when. Boullier: No, it is too early to say this, obviously. We wanted to give a little bit of track time to Bruno as the reserve driver and we are happy so far to keep Nick (Heidfeld) in the car. Yes, I think Romain is on our radar maybe for next year but there is absolutely no consideration to give him some track time now. Q: (Ian Parkes - Press Association) Question to Eric, Jonathan and Graeme. You have talked about the Sky/BBC deal. Jonathan, you specifically mentioned about the wants and needs of the fans. Point number one is that it really doesn‘‚ t matter what the fans want does it, as the deal is already done. Bernie (Ecclestone) has got the deal all signed and sealed. And, secondly, going on the reaction this morning on Twitter, on fans forums, the overwhelming majority of those fans are wholly against this deal. Can I just get your reaction to those comments. Boullier: With the latest I have been told actually about this deal, I think it is rather good news. It should be positively welcomed by the fans, even if they have not been maybe calling into a forum to discuss the idea. My understanding is there will be more TV viewers, there will be more access to F1 and F1 will broadcast much more through two different channels that are BBC, on free-to-air, and Sky, so with the latest info I have got it is a good deal, as it is good for Formula One and it is definitely much better for fans. Neale: I am not sufficiently aware of the detail of quite how that is going to operate. What I can say is that if you look at the last two or three years then Formula One, whether through the teams‘‚ association, or whether through the FIA, has taken a number of steps to try and keep the racing exciting and grow that audience. I think everything from the fans‘‚ forum to the amount of digital content that we are now pushing out into the networks says that we are extremely interested in what the fans are doing. They are the backbone of the global reach that we have and we do listen to them, so I disagree with your first assertion that it is just riding roughshod over that, but I can understand some of the concerns when the detail isn‘‚ t there. Lowdon: I agree completely with Jonathan that the fans are the most important aspect as ultimately it‘‚ s a very, very important part of the cycle of the commercial side of the sport that we are in. I am a great believer that the fans will tell us what they think and I think it is very difficult for us to speak on behalf of fans, that‘‚ s for sure, and I think that‘‚ s the same for any commentator. Time will tell whether it is good for the fans or not and I am absolutely certain, especially in this day and age, that the fans will make their view pretty clear. Q: (Mark Meadows - Reuters) Just a quick follow up to that. There is a bit of talk around that it is in fact in breach of the Concorde Agreement. What would be the situation with that, if indeed that is the case. Lowdon: I would be pretty surprised if it was. I think Bernie knows the Concorde Agreement pretty well. Neale: I think that is a fair comment. I am sure it has been closely scrutinised and will be the subject of much debate. Q: (Dieter Rencken - The Citizen) Rob, as the only engine company executive here and also the representative of engines on the Formula One commission, I wonder if you could give us your comments regarding the move of Gilles Simon from the FIA to a competitor from 2014 onwards, considering that he was the man who drove the engine regulations through the FIA? White: I guess the first remark is that it is very fresh news. We haven‘‚ t had much of a chance to reflect on it. First reactions are fairly predictable and understandable from my part. On a personal and professional level, we‘‚ ve had good relations with Gilles for a long time in his present - for a couple more days - job, and in his previous job at Ferrari. Of course, it‘‚ s of concern to all of us that in this close relationship with Gilles and the FIA over the past year, 18 months, that we‘‚ ve given unprecedented access to Gilles - we certainly have at Renault and I believe all of the engine companies have done so, particularly in respect of the state of progress in our respective engine development programmes alongside the rules package. And so, of course, we would be most concerned to be reassured that information to which Gilles has had access to in those very privileged circumstances as a representative of the FIA is not used in his new capacity as an employee of a competitor. Q: (Dieter Rencken - The Citizen) So to all five of you, about ten years ago Charlie Whiting considered a move from the FIA to one of the teams and that was ultimately blocked. Should a similar situation be blocked, and should safeguards be put in place for the future? White: I think that is the kind of question that is the immediate extrapolation of my previous remarks, Dieter, I think Formula One as a whole needs to be conscious of. It‘‚ s a very complicated sport. In order that the technical and sporting regulations can be administered successfully, then we require the governing body to have good people and they probably require to have access to the teams, and therefore there‘‚ s an obvious risk that needs to be managed, if the same people can crop up in a different shirt very shortly afterwards. Q: (Miguel Sanz- Marca) Mr Newey and Mr Neale, I want to know if it‘‚ s possible for a person like you, with your responsibilities, to stop working, or even thinking, in the forthcoming summer break? Newey: Yeah, definitely. I think you have to be able to, otherwise it would be completely all-consuming and probably not healthy because I think for most people creativity and so forth is part of the job and if you do nothing but think about the job, you probably lose that ability. Neale: Yeah, I think that‘‚ s a good point. When we first agreed to do the shut-down, there were a number of us who thought that was going to be problematic. Now most of us think that it‘‚ s a blessing, when you look at the length of the season and the hard work, not just for the teams, or even Adrian or myself, but also the FIA and the number of people who keep the show on the road. I think everybody looks pretty tired and they could do with a break. Q: (Tony Dodgins - Tony Dodgins Associates) I take on board what Graeme has said about potential new platforms and also Eric‘‚ s comments, but at the moment we have all races live on free-to-air in the UK and presumably we will have half of them in the future. If that‘‚ s replicated in other markets, other countries, are there concerns about the impact of that on sponsorship? Lowdon: Yes, obviously. The model has to reflect the commercial model of the sport, there can‘‚ t be a disconnect in the commercial model, it‘‚ s really quite clear. I doubt whether the commercial model in Formula One... everything in Formula One changes, everything moves forward and so I will imagine that the commercial model will as well. It‘‚ s vitally important that the requirements of the fans are reflected in that and I would anticipate that if there were this kind of move on a global scale instead of one specific market, then the overall model would have to change for the teams, not just to be profitable but to be sustainable and obviously the sustainability of Formula One is very important. It‘‚ s a sport with great tradition and it has a fabulous future and it‘‚ s important that that future plays out. Boullier: I don‘‚ t have much to add, Graeme just told us what he thinks and I also believe the same. Based on this business model today, which is only free-to-air, we can obviously sell to the sponsors the great access to fans and TV viewers. If you start to reduce the free-to-air broadcasting you obviously have to change the business model and it will affect the sustainability of the sponsorship. In the case of this deal, I think we need to wait to have more details because my understanding is that it will still be free to air and that there will be better access to Formula One for the fans which will, in the end, be much better. Q: (Rainer Melch - Rhinegger Tageblat) Eric, can you tell us how pleased you were with Bruno‘‚ s performance this morning? Boullier: Considering he didn‘‚ t do any races so far this year, and he just did a couple of demos, he did quite well and adapted quite well to the car. He had a safe approach this morning and was building up his speed through the session. I‘‚ m quite pleased with what he has been doing and what he was expected to do. Q: (Yelda Canci - TRT) We heard that the Turkish Grand Prix will be dropped from the 2012 calendar; what are your personal opinions about the Turkish Grand Prix and did you share your opinion with Bernie Ecclestone? Neale: I think it‘‚ s always sad when we lose a grand prix from the calendar. I think we‘‚ ve had terrific support from the Turkish people when we‘‚ ve been there. We‘‚ ve enjoyed our racing there very much but the sport is popular and there is a limited number of sessions that we have, so we have to accept that the sport has to move forwards but we are sorry to see Turkey go. Boullier: I feel the same. It‘‚ s obviously very difficult to lose any Grand Prix. I guess there were some reasons to change the calendar. It is very sad not being there, to give the show to the Turkish fans and especially at this very nice track, but we have to deal with some changes in Formula One sometimes, and we can just expect and hope that we will be back there. Lowdon: I agree completely with what Eric and Jonathan have said. I think you‘‚ ve also said from a personal point of view that we will certainly miss going there, really thoroughly enjoyed both the destination and the culture and certainly had a lot to offer Formula One. The calendar has 20 races next year and 21 - certainly talking as one of the smaller teams - 21 would have been too many and so the reality is that there had to be some give somewhere. Newey: It‘‚ s a shame, Turkey is a good circuit, a circuit that was enjoyable from a car perspective, the drivers‘‚ perspective. I think the key thing is that we don‘‚ t go too far down the temporary tracks route, that Formula One as an industry supports the permanent tracks. I gather there‘‚ s a danger that Barcelona could be lost relative to Valencia, and I think that would be a tragedy, to end up going to a temporary Valencia rather than a permanent Barcelona. White: I think Turkey‘‚ s a great driver‘‚ s track and everybody enjoys it. A bit of an anorak fact to throw in, just at the end, it‘‚ s also got the finest dust of any track on the F1 calendar, and therefore to be an air filter engineer, it‘‚ s the most difficult race. Q: (Peter Farkas - Auto Motor) Follow-up on the PURE question: I‘‚ m not sure that anyone took this PURE business really seriously at the beginning, but now that Gilles Simon has gone there, I think it might be a different story. Do you really think there is a place for a new engine manufacturer in F1, someone like PURE which has no history, no background? Do you think there are potential teams which will switch? What are your thoughts about new engine manufacturers coming into the sport? Lowdon: Unlike Rob, we don‘‚ t make engines, so I will really answer it in a very simplistic way. From our point of view, we really don‘‚ t mind about the new engine as long as - first of all - it adds to the show, secondly, it provides a cost-effective solution for the teams, both in terms of how much the engines cost to buy and to run and also we certainly don‘‚ t want to see this turn into an engine formula. As I say, we don‘‚ t make engines, we run a racing team and that‘‚ s what we‘‚ re about. So from our point of view, it‘‚ s nice to see a wide selection of engines but the primary concern from our point of view is cost and availability and that‘‚ s really key. Q: (Peter Farkas- Auto Motor) Have you been approached? Lowdon: Yes, yes, I think every team has. Q: (Frederik Af Petersens - Honorary) You said earlier that the new TV contract in England, which is 50-50, as far as I know there has been no increase of viewers for pay TV anywhere so why should it be better for the viewers that they suddenly have to pay to watch, when a lot of people are hanging on to the dollar that they earn because of the financial crisis, so why should it be better when they have to pay for something that‘‚ s free today? Boullier: With the latest understanding that I have from... the good added value is that Sky will broadcast much more information and show any reports and that‘‚ s extra information that we will share with the public and with the fans. This is where the added value is. RTL? Your argument is that this is Germany, not England. I‘‚ m not sure that we understand RTL in England. Lowdon: Also, we haven‘‚ t seen all of the detail. I haven‘‚ t read about pay-per-view. In the UK, you still have to pay for a television licence if you don‘‚ t watch... People pay for everything. Neale: I just think it‘‚ s a little bit premature to be completely judgemental about this until we‘‚ ve seen the detail. Q: (Matt Coch) Now that the 2012 calendar is set in stone a little bit, I‘‚ m curious to learn how much that dictates the design of next year‘‚ s car. Losing a circuit like Turkey, does that change anything, given that there are more slower circuits? Newey: Not really, because it‘‚ s an incremental change so yes, if you consider the changes in the calendar perhaps over a five or ten year period, the general trend towards slower circuits then that would change your car, but losing one race on its own doesn‘‚ t change the overall philosophy of the car.